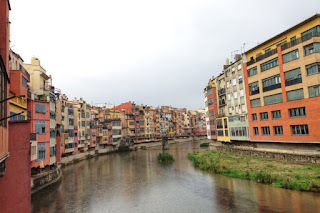 A few travelers might not have Girona high up on their travel list when planning a trip to Catalonia, but those that have been there will certainly tell you why this charming medieval city with beautiful Romanesque and Gothic buildings and picturesque houses overlooking the river Onyar deserves at least a day trip. 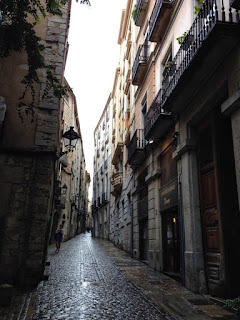 Girona is a compact city and its rich history is kept alive by its well preserved Jewish quarter, the surrounding medieval wall and the remains of Força Vella, the ancient Roman fortress. 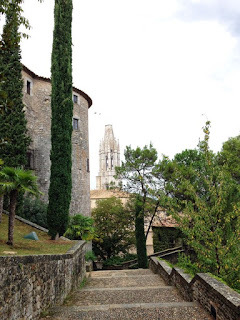 Here's my list of some of the top Things to Do in Girona, while experiencing its medieval architecture, history, culture, food and drinks. The right bank of the river Onyar, which bisects the city is home to the charming old town, with narrow walkways and cobbled streets. Walk around, this compact town and discover the hidden squares and its medieval architecture. There are many small cafés and restaurants where you can stop by and get a drink or food while exploring the old town. The brightly colored houses overlooking the river Onyar are the most symbolic image of the city and also the most photographed scenes of this lovely town. One of these famous houses is Casa Masó, which is open to the public. The house is the family home of Rafael Masó i Valentí, one of the outstanding Catalan architects of the early 20th century and Casa Masó is considered as one of his most important architectural works. Stop by the bridges to get a great view of these houses and appreciate the colors of this medieval town and its picturesque setting that reflects the surrounding landscape. Most of these houses were built during the 19th and 20th centuries but their facades were restored in the late 20th century. 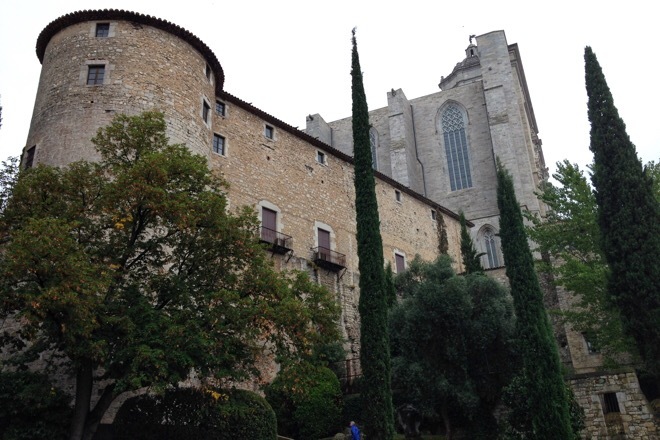 The old fortifications of Girona include the western world’s largest sections of wall dating from the time of Charlemagne. The wall with walkways and lookout towers offers spectacular views of the surrounding hills, countryside, buildings and rooftops. The wall can be accessed from Plaça Catalunya, University of Girona Barri Vell campus and the Cathedral. Parts of the wall were demolished late-19th century to allow the city to expand; the missing parts have now been reconstructed. The Jewish quarter located within the Força Vella is one of the best preserved in the world. It still has its medieval aura, and its maze of narrow alleyways, courtyards, stone steps, charming bookshops and restaurants are a great attraction. 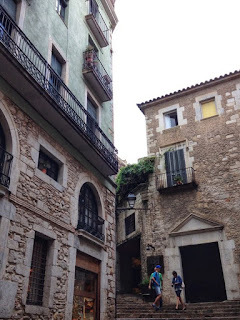 The history of the Jewish community in Girona dates back to the end of the 9th century, initially as isolated houses and as a more established community by the mid-12th century. The Jews were a very important community in Catalonia, established in different cities until their expulsion in 1492 when the Catholic Monarchs outlawed Judaism throughout Spain and Jews were given the choice of conversion or exile. Walking around this part of the town is a trip back in time. For exploring the history of the Jewish community, you can visit the Museum of Jewish History in this old neighborhood. Wear comfortable shoes as you will be walking up and down the hilly area and the floor is stone-paved. The 16-century stone steps that lead up to the Sant Martí church are stunning and as you walk up these steps take a moment to observe the little intricate details on the walls, doors and small balconies around you. 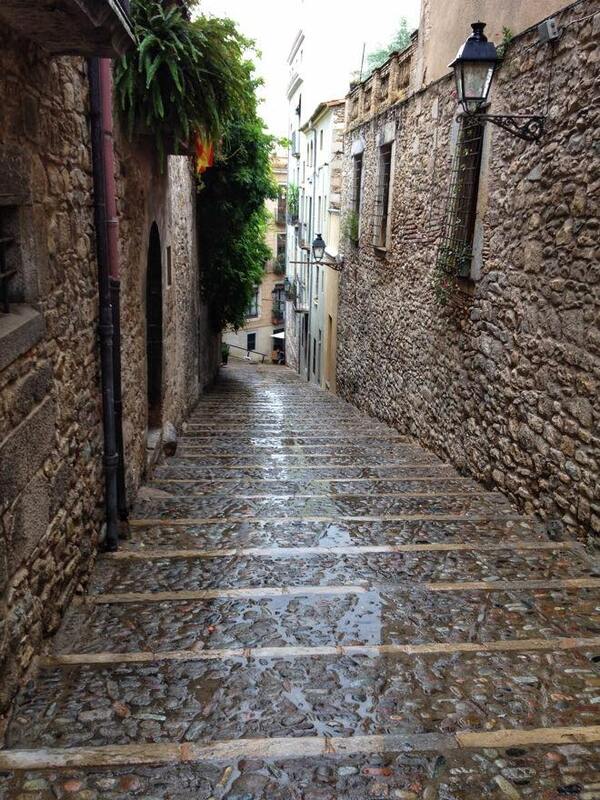 Midway up the steps, there is a small flat square Pujada de Sant Domenec with a nice bistro, Cafe Le Bistrot. If it’s not too crowded, find a table to sit down here and enjoy a drink with some Catalan food. 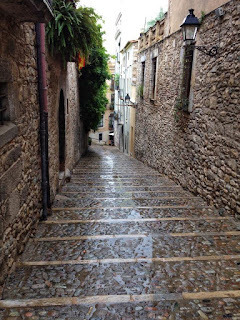 Viewers of Game of Thrones will recall the famous stone steps of Girona which featured in season six episodes of this popular drama television series. Built between the 11th and 18th centuries, the cathedral includes a series of walls and spaces in different styles, from Romanesque cloister to the baroque façade and steps. The cathedral has the widest Gothic nave in the world. 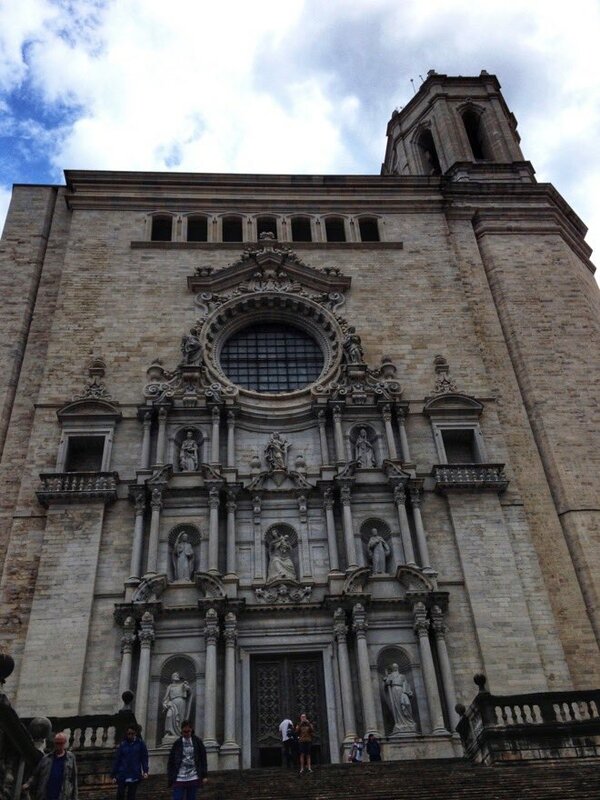 The most majestic view of the church is from the bottom of the stairway at Plaça de la Cathedral. A worthwhile stop is the Museum of the Cathedral to see the Tapestry of Creation, which is a masterpiece of medieval needlework from the 11th century. Behind the cathedral is the Passeig de la Reina Joana, a pleasing natural setting with trees, trails and shaded stops. 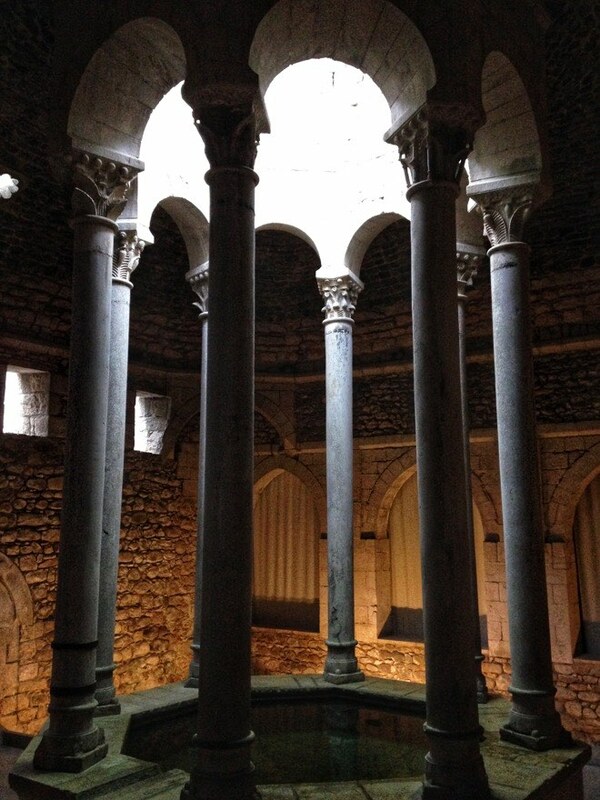 These 12th century baths known as Banys Àrabs are housed in a beautiful Romanesque building inspired by Roman public baths. The highlight is the impressive octagonal swimming pool in the center. 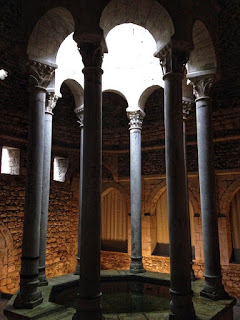 The Arab baths are a few minutes walk from the cathedral. The building is divided into several rooms that allow one to move from the areas with the coldest water to those with the hottest. The ancient Roman history of Girona can be experienced through the remains of the Força Vella fortress which was built by the Romans in the 1st century BC. The fortress was well protected by a defensive rampart built from large square-cut stones. The Roman wall was the first city enclosure and it remained unchanged until the year 1000. Parts of this ancient wall can still be seen today, as the earlier wall was rebuilt and extended during the Middle Ages. The church in honor of Sant Feliu is the oldest church in the city. It has a mix of different architectural styles: the layout is Romanesque (12-13th centuries), the vaulted roof is Gothic (14-15th centuries) and the façade is Baroque (16th century). If you plan to enter inside the church consider buying the combined ticket which will also give you entry to the cathedral and the Museu d’Art de Girona. Girona is a great day trip to make while visiting Barcelona. 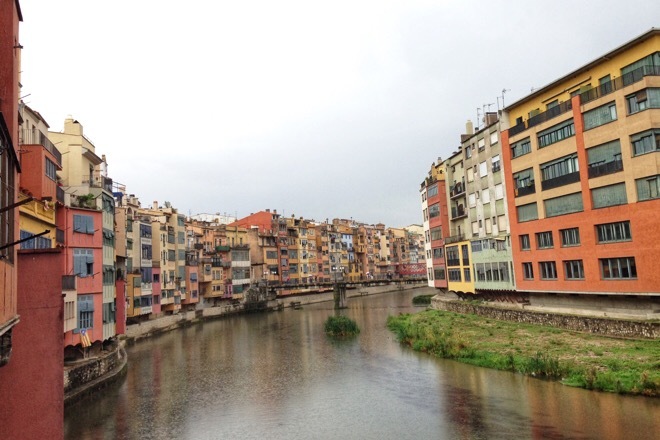 The best way to travel from Barcelona to Girona is by train which depart from either Sants Estacion or Passeig de Gracia, both located in the center of Barcelona. A direct train takes around 40 minutes and all trains arrive at Girona's main station, which is 10 minutes walk from the city center. The old medieval town is north of the train stain, about a 25 minutes walk. The medieval town is on the right bank of the River Onyar, so after you have crossed the bridge, a good place to start your exploration is from the tourist information office, located at Rambla de la Llibertat, 1 where you can get the maps and any information you need. The best way to explore Girona is walking along its cobbled streets, stone steps and alleyways, where the monuments are a reminder to the period in history where Jewish, Islamic and Christian communities thrived and each contributed to its diverse heritage. The picturesque houses are best appreciated from the bridges over the river Onyar, while a visit to Casa Masó will let you discover the interior architecture of this famous house overlooking the river. A stroll along the medieval wall is a great way to enjoy the scenic beauty of the surrounding countryside dotted with the rooftops and monuments of this charming city. The remains of the old Roman fortress and walls can be seen near the cathedral square and in the patio of the old university. 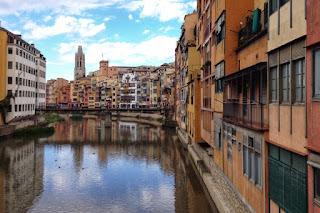 Though Girona can be explored in a few hours it is also a great city to spend a couple of days or perhaps as a base for your Catalonia holiday, particularly if looking for a quieter place than Barcelona. 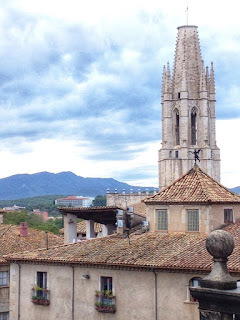 For a list of notes, tips and experiences take a look at our Things to Do Project where travelers have shared useful information, which will help others to better plan their trip and enjoy Girona.